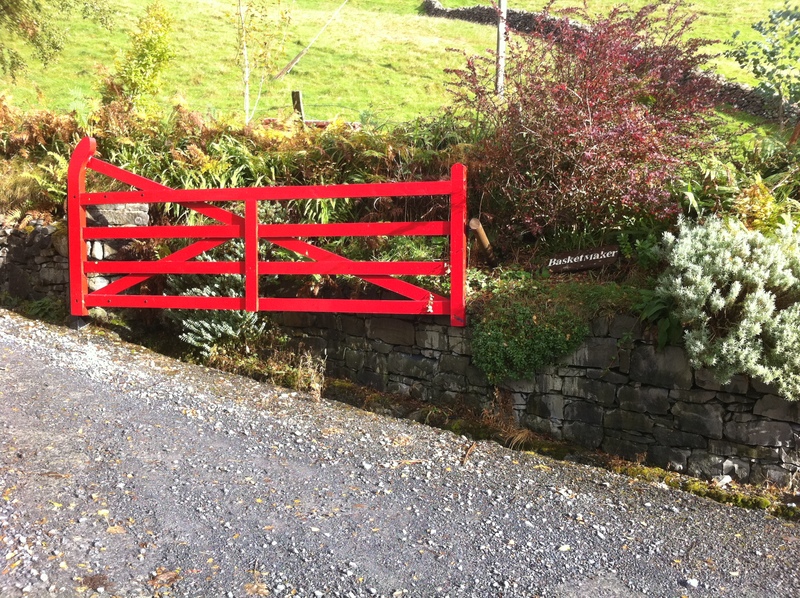 Joe Hogan’s Basket Course – You have got to go! 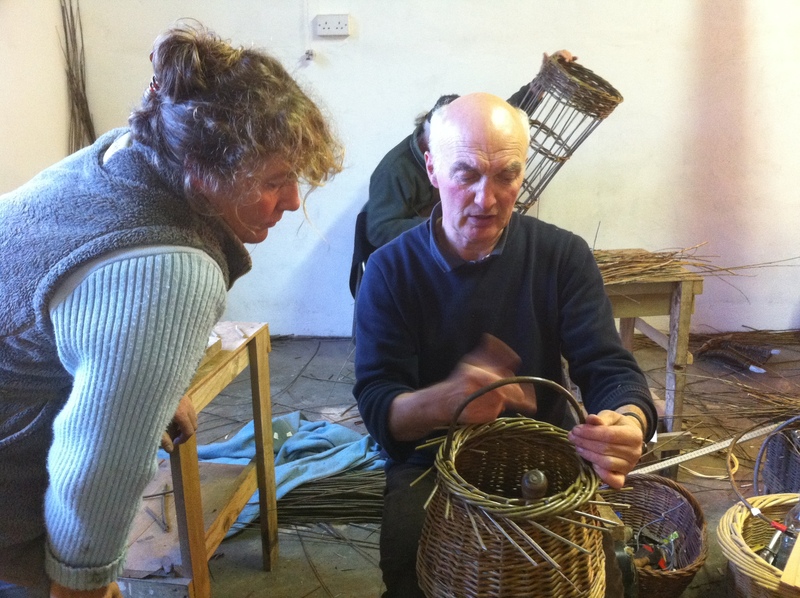 Mel and I have just come back from the most fantastic trip to North West Ireland where we spent 4 days basketmaking with Joe Hogan in Loch na Fooey in Galway. 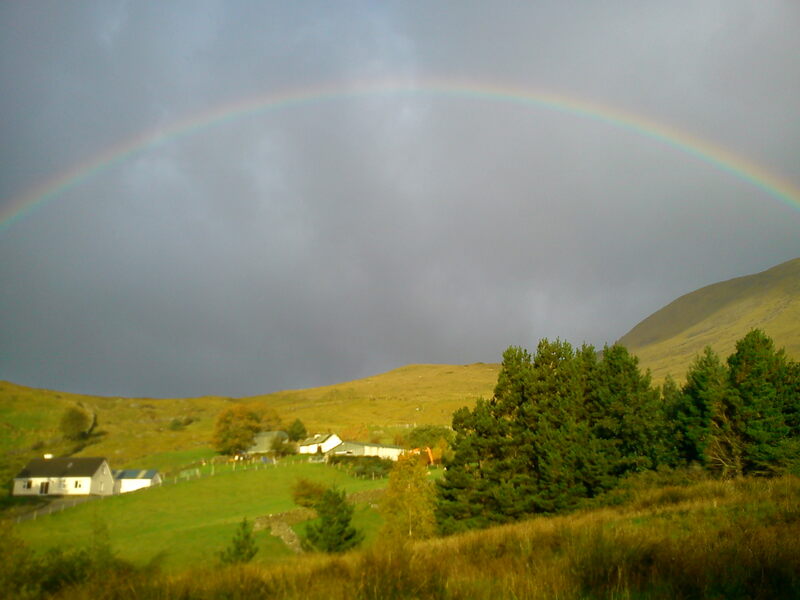 The location is unbelievably beautiful and the tuition superb. 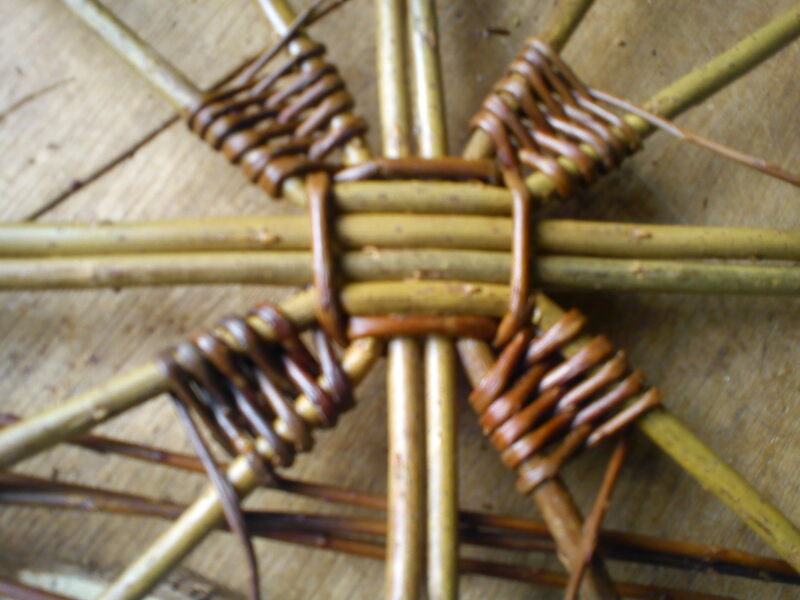 We made a selection of baskets between us – traditional Skibs, a Kisheen, a celtic knot basket, a rectangular small log basket and a hedgerow birch bowl. Joe not only skillfully teaches you anything you want to know, but also provides cosy accomodation, a delicious lunch and a visit to his willow bed (including cuttings). It’s just got to be an annual trip! 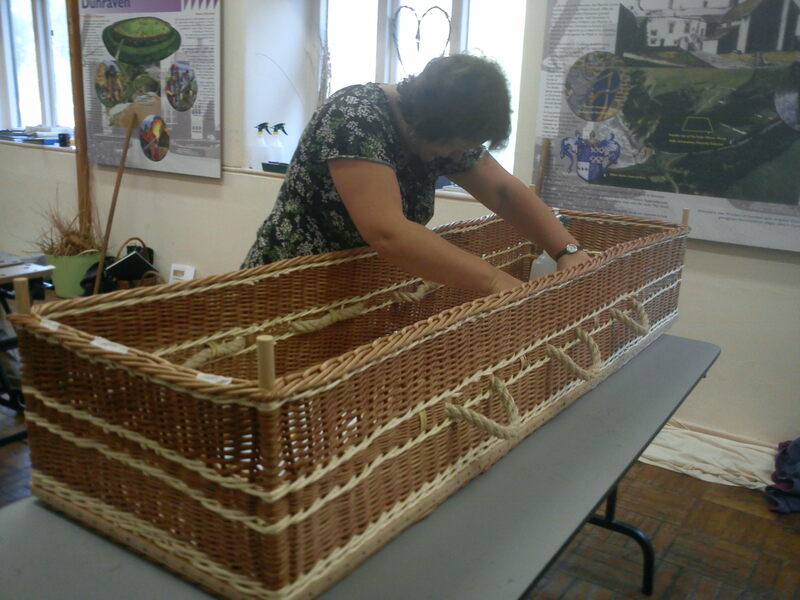 The first week in October saw the beginning of our Pilot Residential Coffin weaving course. 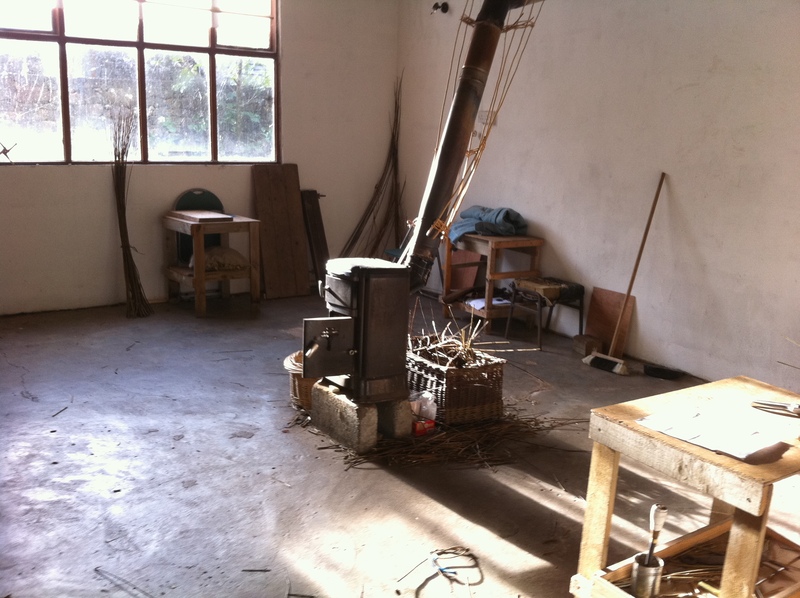 Monday and Tuesday was spent gathering materials and preparing willow for the course which began on Wednesday morning. 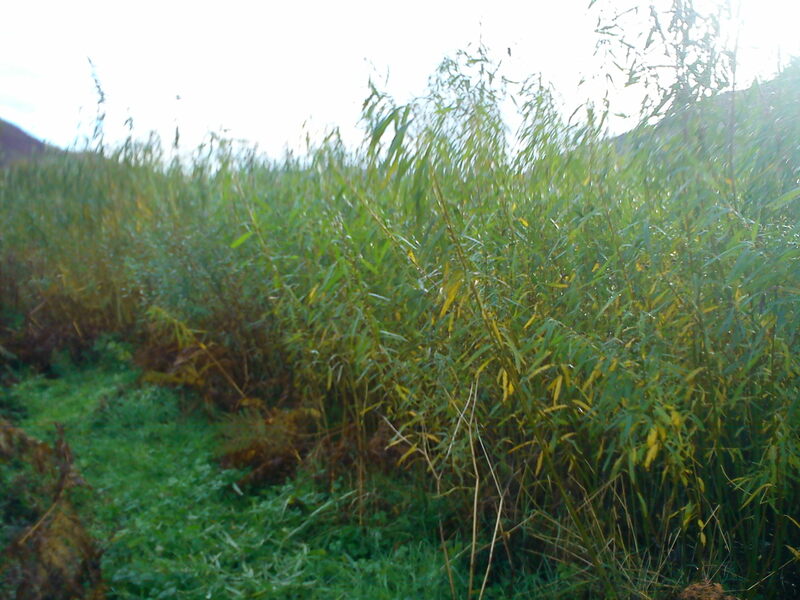 Roy Youdale arrived on Tuesday night with Lynne and Rosemarie and immediately set us to sorting out vast quantities of 6 and 7 ft willow which would form the main weaving material for the 4 coffins. Roy has made a number of coffins and is reknowned as a skilled craftsman and teacher producing basketry of an extremely high standard. Susan Early from Gloucester, Lynne Saunders from Dorset, Rosemarie Cooke from North Devon and Jill David from Penarth were the willing guinea pigs who had volunteered to spend several long hard days learning new skills to make their own coffins. The course was held in the Heritage Coast Centre in Dunraven Bay in Southerndown and our 4 ladies were staying in the basic but comfortable bunk rooms in the centre. Roy enjoyed wonderful hospitality at the beautiful Little West Bungalows Bed and Breakfast with Hazel and Roger Norfolk. Wednesday morning saw the staking up of the wooden bases. 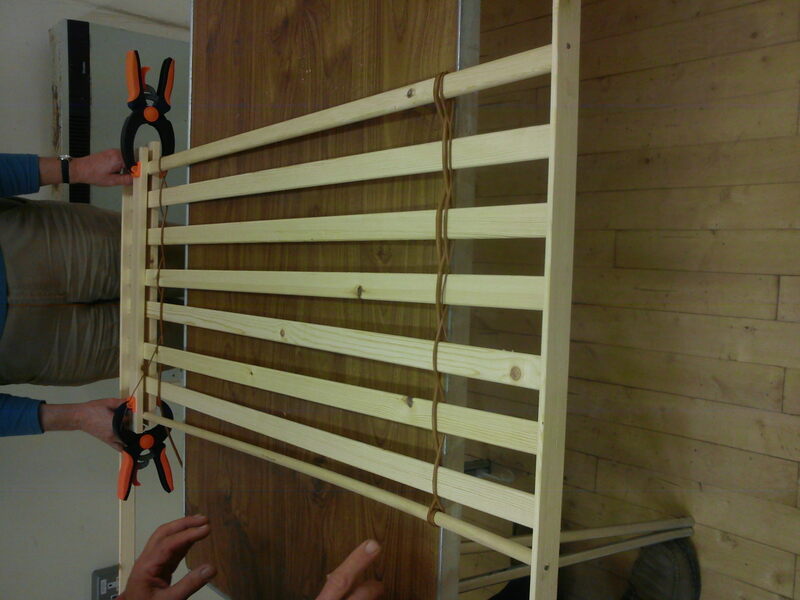 Roy demonstrated how to insert the stakes and form a simple trac border underneath the coffin base. Everyone quickly got on with the job and by lunchtime were ready to put on the first rows of waling. 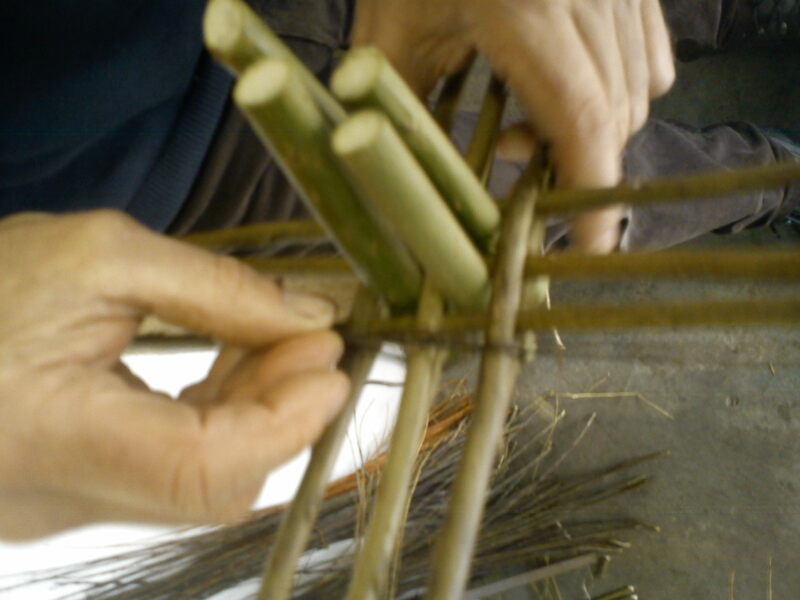 Roy demonstrated the use of a ‘Willow Winder’ which precurves the willow and enables a lovely loopy curve on the wale. Everyone was keen to try this out and 4 beautiful rows of waling ensued. 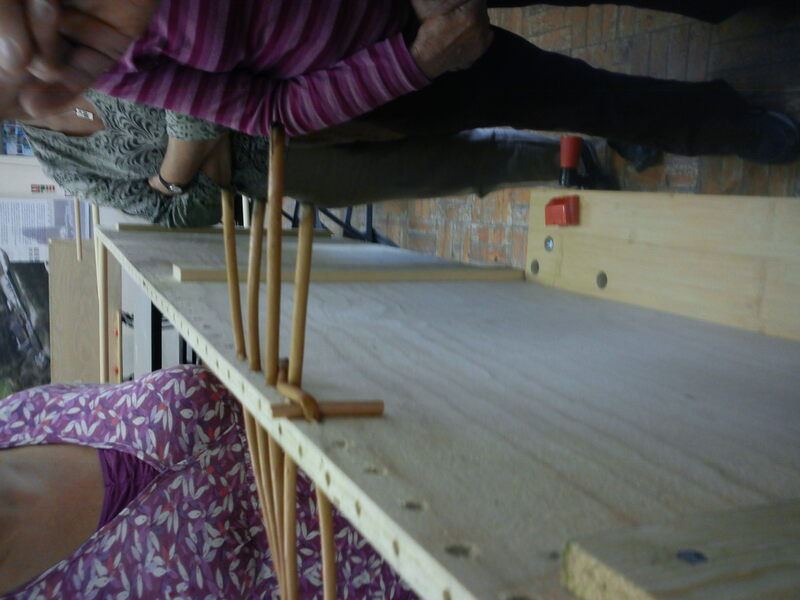 The ladies then started out on the french randing which was to form the main weaving on the coffin. 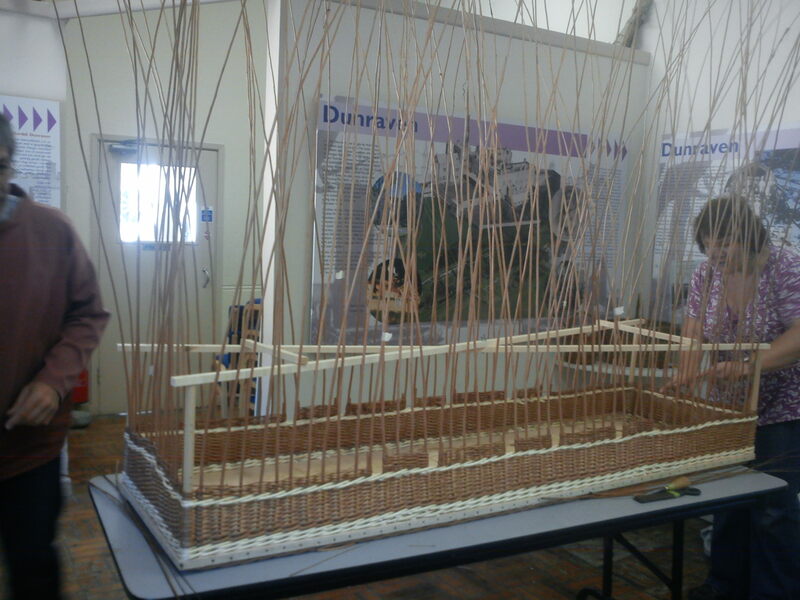 The coffins were rectangular in shape and detailed with sisal rope handles and a beautiful base plait border. Roy provided expert tuition and many resources which facilitated the production of four beautiful coffins – 4 days later. Roy and our volunteers worked incredibly hard – one night until 10.30 pm – and we would like to offer enormous thanks to all 5 of them! We hope to run the coffin course annually but have decided that the course will have to be run over 5 days. 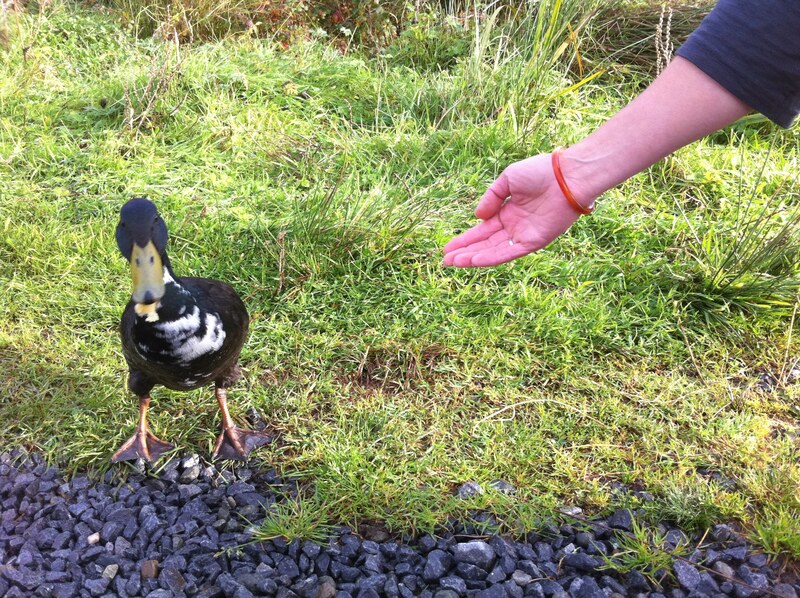 Roy will therefore have a manageable teaching commitment and our course participants will be able to fully appreciate our wonderful area by having a little spare time to rest and relax! If you would be interested in attending such a course let us know and we will put your name on the waiting list. RE the Willow Winder, Les has been busy with his wood turning lathe and produced some lovely ‘Willow Winders’ which he has for sale for £10 – I can see these becoming as essential as the rapping iron in teh basketmakers tool basket – If you would like to get hold of one let us know and we will pass Les’s contact details on to you.